Does Studying the Universe Change Your Perspective of the Environment Around You? An 8th grader doing a research project on astronomy recently emailed the Warren Astronomical Society asking "Does studying the universe change your perspective of the environment around you?" In this post, I expand upon the response I wrote back to that student. Absolutely it does! Astronomy and cosmology are enormously wide fields of study, encompassing everything from quantum mechanics down at the sub-atomic level, to the interactions of (as of yet) unseen dark matter on the large-scale structure of the universe. Studying how gases in Earth's atmosphere and liquid in the oceans reflect and adsorb light, and radiate heat is but a small part of understanding how Earth’s climate functions and can change over time. The same principles used to study the Earth's atmosphere can be applied to the atmospheres of other worlds; Venus is an example of a "runaway greenhouse effect," and should be viewed as a cautionary tale for Earth's ever increasing CO2 level (410.31 parts per million as of May 2, 2018). Visualization of Earth CO2 Data. Credit: NASA Eyes on the Solar System / Bob Trembley. NASA's Eyes on the Earth - a module within the Eyes on the Solar System app allows you to visualize climate data. NASA's Eyes is available free for the PC/Mac. The Earth has a lot of volcanoes, but pales in comparison to Jupiter's moon Io - which is the most actively volcanic body in the solar system. Cryovolcanoes have been discovered on several icy bodies in the outer solar system - volcanoes of this type do not exist on Earth. Mars is home to the tallest extinct volcano in the solar system. 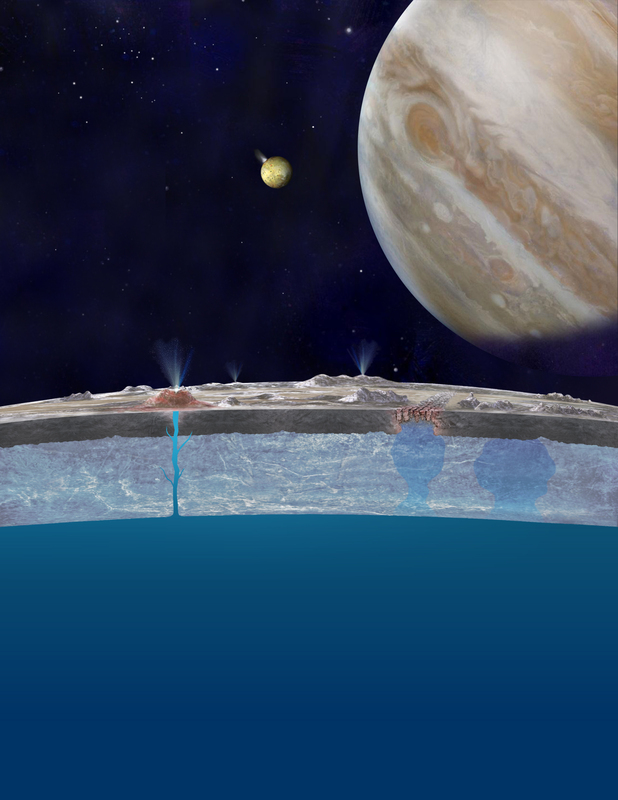 Evidence for plate tectonics has been observed on Jupiter's moon Europa. Active volcanoes on Jupiter's moon Io. Image via the Juno spacecraft (NASA/JPL-Caltech/SwRI/ASI/INAF/JIRAM), processed by Roman Tkachenko. Studying geologic processes on Earth can help us understand how those processes might work on other worlds - both in our solar system, and in exoplanetary systems. Studying those processes on other solar system bodies gives us more than one data point to work with - specifically, the Earth. Studying the life-cycle of stars gives you the understanding of how "heavy elements" in the universe were created after the Big Bang. This process is called stellar nucleosynthesis, and it's absolutely wondrous! The atoms of your body, and everything around you were created in stars that lived and died - some spectacularly so, long before the Sun was born. This is what Carl Sagan meant when he said "We're made of star-stuff." Stars and planetary systems condense and form out of the interstellar medium in what are called stellar nurseries. The interstellar medium contains dozens of molecules, several of them are organic molecules - including Glycine – the simplest of all amino acids! Many of these molecules are considered the “building blocks of life;” the planets, moons, asteroids and comets of our solar system and those in every exoplanetary system in the galaxy, formed with those molecules already present! Molecules of this type continue to rain down on the Earth to this day - I find that concept just amazing! "Life Will Find a Way"
Life on Earth exists in an enormous variety of species; there are lifeforms called extremophiles that can survive in environments we humans would find deadly. Deep in the lightless depths of Earth's oceans, near mid-ocean ridges, there are hydrothermal vents spewing mineral-rich water ranging in temperature from 60-464°C (140-867°F). Amazingly, these incredibly harsh environments support rich ecosystems. Plumes of mineral-rich water have been observed on Saturn's moon Enceladus, and Jupiter's moon Europa. It's very likely that these plumes originate from sub-surface oceans. Tidal forces on the icy moons as they orbit their parent planet may be causing the bodies to be geologically active. There is indirect evidence that hydrothermal vents exist on Enceladus and Europa; could these vents support life too? Hypothesized subsurface ocean on Europa. Image Credit: NASA/JPL-Caltech. We live at a time when it’s almost surprising that we haven’t found extraterrestrial life. The search for life – or rather the signatures of life, are part of several future space missions. The Mars 2020 rover will be specifically looking for past signs of life, and the Transiting Exoplanet Survey Satellite (TESS) will investigate the atmospheric composition of worlds around other stars - when oxygen is found, I expect a lot of excitement! Studying astronomy gives you an appreciation for how rare and precious this Earth is, and all the life that call it home. For the most part, everything I've discussed so far relates to Earth and the solar system. There's another concept in astronomy that is also important to understand: the size of the universe. When you look into a night sky, you see the stars far away. What you're seeing is the light which has traveled from them to you. It takes TIME for light to travel here, so what you're doing is seeing the stars as they were in the past - the amount of time it's taken for that light to reach us. The further away those stars are, the further back in time you are looking. Say you are looking at a star that is six thousand light years away – you're seeing that star as it was six thousand years ago. Now imagine a being on a planet orbiting that star looking at Earth. They would be seeing Earth as it was six thousand years ago. Which of those two is now? Space and time are linked together - as you look out across space, you are looking back in time! This is an absolutely mind-bending concept, and difficult to wrap your brain-around. I've heard several people mention that the size of the universe "makes them feel small and insignificant," but it's really all a matter of scale: to a bacterium in your gut, you are the size of a galaxy! Your body is the perfect size to support the incredibly complex collection of neurons that is your brain; a brain that has the capability of experiencing, appreciating and exploring the wonders of the cosmos. I concluded my email to the student with "I have only scratched the surface here…” and is that ever true! There are so many aspects to astronomy, it simply cannot be learned properly by students in a couple weeks, or a couple semesters. With the advent of space telescopes and reconnaissance orbiters, vast amounts of data are being returned, and the number of discoveries is almost impossible to keep up with! Citizen Science programs have evolved out of the need to help process this data - several targeting student participation. What an exciting time to be a young student entering into the world of astronomy! Studying the Universe gives us an appreciation of how great God’s creation is. At least, that’s what it does for me since I started with astronomy as a hobby years ago. It’s our job to take care of it to the best of our ability. First of all, studying the universe with science gives you a better sense of, to put it simply, “what truth looks like.” Once you see how science reveals a universe that at the same time is rational and yet bigger than any one simple rational system can contain, you are prepared both to reject superstition and at the same time reject any system that’s too simple to be true. Second, the more we see the universe scientifically but with the eyes of faith, the more we can appreciate what it means to believe in a supernatural Creator.